DOH’s PolicyMap is an online mapping tool with a variety of data sources around healthy food access and built environment (bike/pedestrian/multi-modal transportation) that can be used to create an in-depth, visually-rich local snapshot. For example, this mapping tool could be used to show farmers markets that accept EBT. Please visit PolicyMap’s tutorial page for a complete walk through of all features and functions on PolicyMap. SNAP-Ed (Supplemental Nutrition Assistance Program – Education) is a program funded by the United States Department of Agriculture (USDA) Food and Nutrition Service (FNS) to promote healthy eating and healthy lifestyles among low-income populations. SNAP was formerly called the Food Stamp Program. 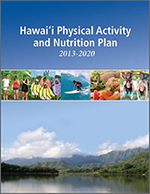 In Hawai‛i, the program has two components: direct nutrition education, (led by our partners at the University of Hawai‛i Cooperative Extension Services), and the support of policy, systems, and environmental (PSE) changes—shifts that make healthy lifestyles easier where people eat, live, work, learn, shop and play. These two components must impact communities, schools, and families who meet income eligibility standards for SNAP-Ed, which vary depending on the setting. Early Care and Education (ECE): We work with childcare facilities and administrators to promote the Hawai‛i ECE Wellness Guidelines and offer training and technical assistance in curricula such as Farm to Keiki. Schools (K-12): Working in close partnership with the DOH School Health program, SNAP-Ed supports the implementation of the HIDOE School Wellness Policy. We also support farm to school initiatives through developing partnerships such as the Hawai‛i Farm to School Hui. Built environment: In order to ensure healthy food access for all, regardless of housing or transportation access, we have partnered with the DOH Built Environment program to work on issues such as complete streets, active transportation, housing, and urban agriculture. Emergency food relief: SNAP-Ed supports building leadership within the state’s food banks and food pantries to ensure that food bank clients have access to healthy food and other programs and services that help increase self-sufficiency. Children are perhaps the most important population to engage in societal change around healthy behaviors. That’s why we support Youth Participatory Action Research (Y-PAR), an evidence based program that supports teens in identifying and tackling the challenges and assets in their own community, and organizing to make change. 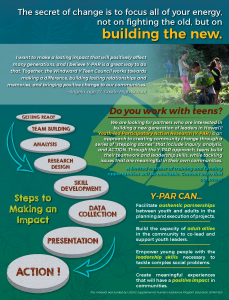 Download the Y-PAR Flyer here.